Although the adoption of market reforms has been a key factor leading to China’s recent economic growth, China continues to be governed by a communist party and has a socialist-influenced legal system. Vietnam, starting later, also with a socialist-influenced legal system, has followed a similar reform path, and other countries too are now looking towards China and Vietnam as models for development. 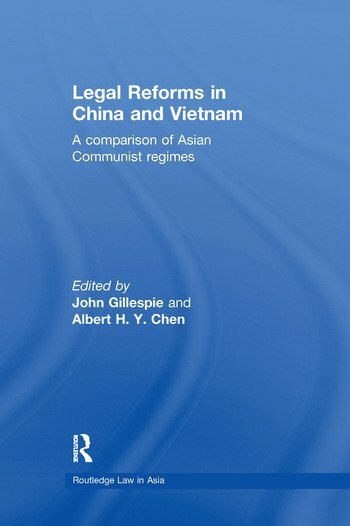 This book provides a comprehensive, comparative assessment of legal developments in China and Vietnam, examining similarities and differences, and raising important questions such as: Is there a distinctive Chinese model, and/or a more general East Asian Model? If so, can it be flexibly applied to social and economic conditions in different countries? If it cannot be applied to a culturally and politically similar country like Vietnam, is the model transportable elsewhere in the world? Combining ‘micro’ or interpretive methods with ‘macro’ or structural traditions, the book provides a nuanced account of legal reforms in China and Vietnam, highlighting the factors likely to promote, change or resist the spread of the Chinese model. Part I Introduction. Chapter 1 Introduction: China and Vietnam Compared Professor Albert Chen University of Hong Kong and Professor John Gillespie. Chapter 2 Sequencing Chinese Legal Development Professor Randall Peerenboom. Part II Debating legal development in China and Vietnam. Chapter 3 Legal Thought and Legal Development in the People’s Republic of China Professor Albert Chen. Chapter 4 The Juridification of State Regulation in Vietnam Professor John Gillespie. Part III Developing an Administrative Law System. Introduction: Professor Michael Dowdle. Chapter 5 Towards Regulatory Neutrality in a Party-State? A Review of Administrative Law Reforms in China Assistant Prof Dr Zheng Ge. Chapter 6 Achievements and challenges in developing an administrative law system in contemporary Vietnam Professor Vu Doan Ket and Matthieu Salomon. Part III Public access to justice. Introduction: Nicholas Booth. Chapter 7 Access to Justice in China: Potentials, Limits and Alternatives Professor Fu Hualing. Chapter 8 Publication and Public Access: the largely inaccessible Vietnamese court decision Associate Professor Pip Nicholson. Part IV Commercial regulatory reforms. Introduction: Professor Donald Clarke. Chapter 9 Commercial Regulatory Reform in China during Transition: An Alternative Path to the Regulatory State Assistant Prof Dr Leng Jing. Chapter 10 Vietnam: The development of commercial regulation in Vietnam Associate Professor Melanie Beresford. Part V The evolving role of legal education Introduction: Professor Jerry Cohen. Chapter 11 China’s Lawyers and their Training: Enduring Influences and Disconnects Professor Alison Conner. Chapter 12 Legal Education in Vietnam: To Change or Not to Change? Bui Bich Thi Lien. Part VII Legal diffusion: the role of non-state actors in shaping the regulatory environment. Introduction: Professor Michael Dowdle. Chapter 13 China: Business Lobbying in China in Comparative Perspective Associate Professor Scott Kennedy. Chapter 14 By-passing the state: Non-state regulation in Vietnam Nguyen Hung Quang. Conclusion: Reflections on legal development in China and Vietnam Professor Albert Chen and Professor John Gillespie. Dr John Gillespie is Professor of Law and Director of the Asia Pacific Business Regulation Group, Department of Business Law and Taxation, Monash University. Albert H.Y. Chen is Chan Professor in Constitutional Law in the Faculty of Law at the University of Hong Kong.